"Filecamp is a lightweight, out-of-the-box, easy-to-use, cloud-based Digital Asset Management (DAM) solution designed for marketing professionals." Filecamp scored 83/100 in the Digital Asset Management category. This is based on user satisfaction (96/100), press buzz (42/100), and other relevant information on Filecamp gathered from around the web. 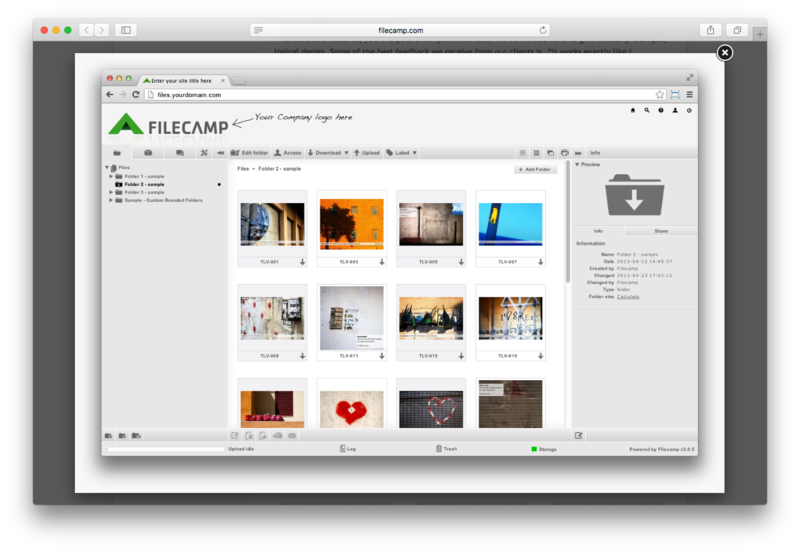 Filecamp is a cloud-based file management solution. Designed to accommodate several formats, you can save whatever multimedia your company manages. Links can be stored and shared with different personnel with ease. 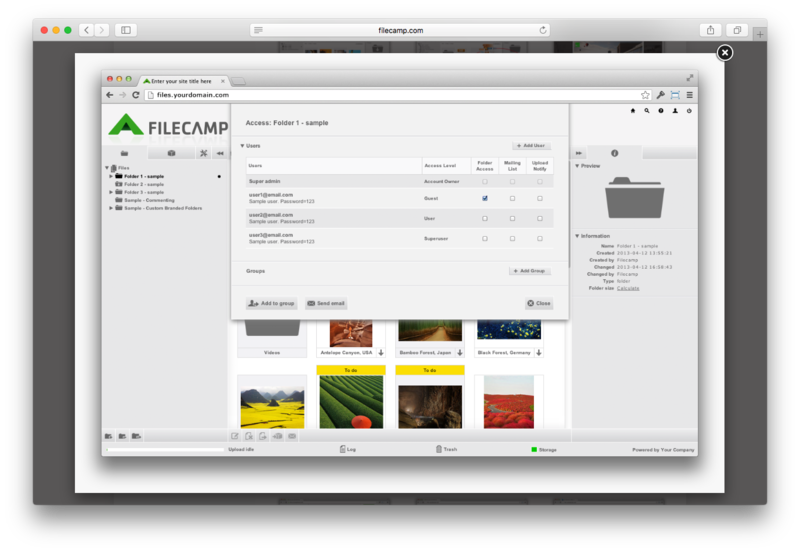 With feedback and online storage features, Filecamp can protect your files and organize them efficiently. The solution lets you manage several documents for multiple desktop computers. The documents can be accessed anytime, anywhere, and on any device. Different formats can be previewed such as JPEG, PDF, and MP4. Folders can also be customized with your own company themes and logos. You can even download the files to a format different from the source. Additionally, the solution can also integrate with your own website. Almost all industries entail that employees, managers, and proprietors alike store and organize a myriad of files. This can range from legal word documents to hours-long videos. With this solution, you can arrange them in a Filecamp cloud server for faster access using a simple drag-and-drop mechanic. Previewing files according to format is also a feature that facilitates faster access. Filecamp also allows you to personalize folders in that it allows you to choose any type of image or logo to use as folder thumbnails. Thumbnails of your own choosing can help you identify what kind of content is in each separate folder. When sending files through email, you can use the system’s Email URL button. Clicking it creates an email with a page containing the file. Recipients get a preview of the downloadable file as well as the ability to, needless to say, download it. Aside from thumbnails, you can also modify your the appearance of your Filecamp account. The software solution’s control panel lets you tweak your account with your company’s color scheme and logo. This feature lets you display the Filecamp page as though it were an extension of your company website. Alternatively, you can simply create a link to Filecamp for the desired page. Filecamp also has a feature it calls “Collections.” These collections are composed of folders in the cloud that are essentially just links pointing to the location of the original files. For example, pictures of a building for sketching can be added to the collection. If you decide to delete the collection, the actual files still exist in their original folders. There is also a metadata option. In the case of media files, you can read and write several new labels for each one. For example, you can label music files according to a genre and you can write what specific genre it is. Other collaborative features, available for all businesses, include an online approval and proofing feature. You can use this to provide comments and notes to written files and documents. You can also invite your customers to provide the service directly from their web browser. Aside from comments, you can make mark files with your own labels. These can include ratings. You can also use them to create indexes for the documents. One standout feature Filecamp has is that the system doesn’t need to be installed—when downloading a file, you and your coworkers or clients can do it directly from the Filecamp site. If you need to download the files in a different format, Filecamp lets you do so. The size, file type, and resolution are all parameters that can be changed. For example, you can download PDFs as JPEGs. If you want an entire folder to be downloaded, you can do it with one click. However, note that the folder must be set to “Public Download” to give it full accessibility to all users. For security, you can set six different access levels for your users. You can also create user groups, allowing you to apply access settings to entire collectives. There is no limit to the number of users, making the entire creation process a hassle-free affair. You can restrict access to specific folders and files to certain clients and coworkers. An audit trail is also available to trace all activity on the site. This can help you check who has checked the files you’ve uploaded. You can also receive email notifications for these actions. To protect files from accidental loss, deleted files are sent to the Trash. This folder is only accessible by admins. The admins are also the only ones who can empty it, as well as set an Auto Delete option. This option can remove several files and folders at set time intervals. Filecamp stands out thanks to a large-scale depth of storage. Any type of data and file can be archived. You can also download and convert these files into other format types for faster convenience. One highlight of the platform is its customization features. Any file that is accessible on the cloud can be checked and edited. You can also add in comments and notes for other users. If you buy the Professional package, you can even remove the Filecamp branding for a completely unique look. As has been mentioned, another standout feature in Filecamp is the customizability of its security system. Each user can be given one of six different user levels including admin rights to ensure the proper distribution of control between employees. You can also stay updated about the activity of the site with the audit trail and email notifications features. The solution has a demo lasting 30 days. If you want to avail of the software solution, there are three different plans each with a corresponding monthly subscription fee. None of these requires installation or set up payments. There are also additional fees for extra data storage that go beyond what is stipulated in the plans. Storage space can reach up to 1600 GB. If you have bigger storage requirements, you can contact the company for a quote. Permissions for files and folders – Restrict documents to specific users and clients. Public download and upload – Entire folders are available to the general public. This can be done either in the cloud or on custom-branded pages. Activity log – Track the movements of users on your site. Search engine – Search for different files with several filters. File transfer protocol (FTP) integration – Entire folder structures and gigabytes of data can be uploaded in one click. Email support – Contact the Filecamp team for immediate assistance. Branded Folders – Change the thumbnails for company branding or visual categorizing. White label – Remove the Filecamp brand. Commenting – Online and offline proofreading of files by other users or clients. 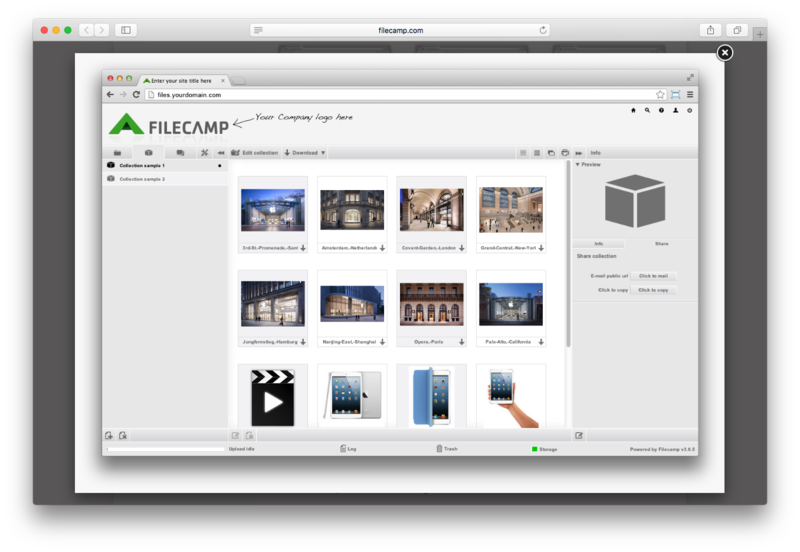 Filecamp is a cloud-based file management and storage solution designed for all browsers. It has several features including a customizable interface and appearance, multi-format archiving, and role-based security. It stands out thanks to its customization and multi-format features for all its files. This software solution is recommended if you want an easy-to-access file database with unique customization features. What is Filecamp generally used for? Who are the main user groups of Filecamp? Does Filecamp offer multi-user capability (e.g. teams)? 4.8/5 based on 5 user ratings.